We've had some decent (but still cold - Winter just won't let go!) weather. 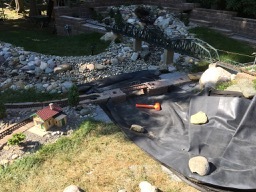 Progress continued on the new waterfall. The next series of shots are of the waterfall/filter unit installation. 1 shows the supply inlet and drain lines attached and the beginning of backfilling. The flexible PVC lines are glued to threaded couplings that were screwed into the filter unit's brass inlet and drain holes. The holes can be seen in the last pic in post #15. The drain is at the bottom. The supply is curling around the front of the filter. 2. Once enough backfill was in place to keep the filter from shifting, the inlet line was buried in its final position. 3. 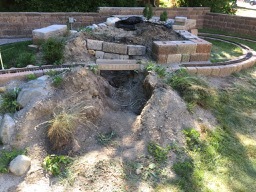 A drywell was dug for the filter drain line. The drain line allows the filter unit to be backwashed for cleaning. 4. Here the drywell hole is lined with perforated poly weed cloth and filled with stone. The drain valve can be seen in the valve box. 5. Thick landscape felt is laid over the drywell to keep silt from filtering into the underlying stone. 6 & 7. The wall was extended around the valve box. The finished height is about level with the filter outfall. 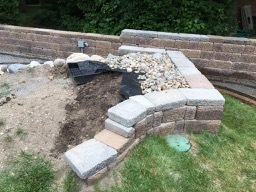 After backfilling, it will give a more natural looking effect to the waterfall. There is a possibility the drain won't flow freely enough to allow cleaning of the filter unit. If necessary I can uncover the drain outlet to let it flow onto the lawn unimpeded. The supply line trench is dug from the isolation valve to where the line will cross under the original stream bed. The bed liner has been cleared of stone so the supply line can be more easily slid underneath the liner. 9. 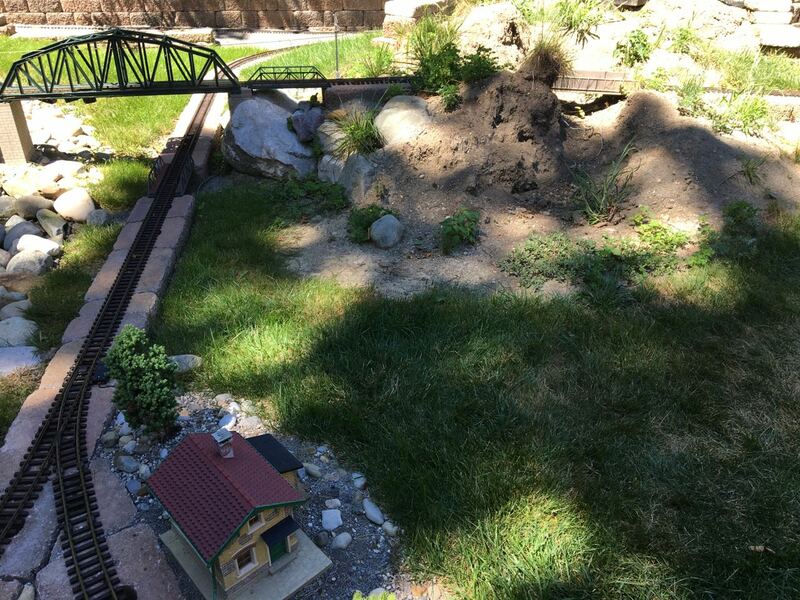 Here the supply line has now passed below the original stream bed. And, most of the stone has been replaced. The supply line trench has been backfilled where the line passed under the stream. 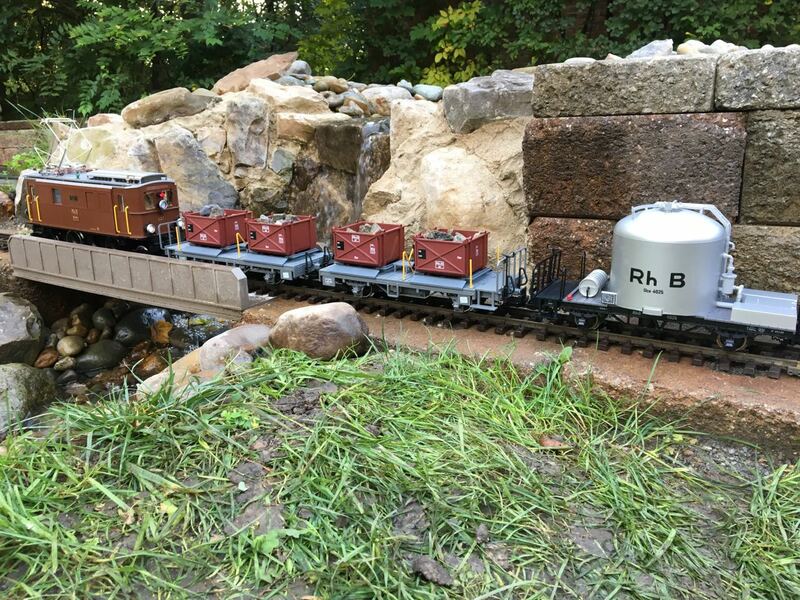 The supply line can just be seen snaking between the roadbed and stone outcropping supporting the right side of the bridge. If you look carefully a black wire can be seen below the Kuoni boxcar. This is a low-voltage line that was passed under the original stream bed with the new waterfall supply line. 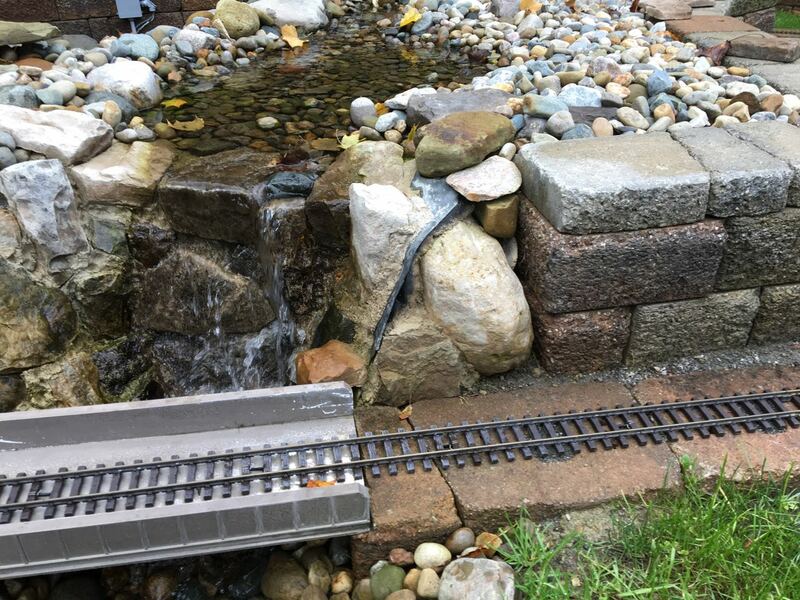 It connects to the 12V low-voltage lighting for the original water feature. It will supply power for lighting the new waterfall. I may also tap into this to provide building lighting for future lineside structures rather than use the rails for power. The 60w power supply has plenty of extra juice available. The twisted green and red wires are 12 AWG supply lines that will bring rail power from a booster yet to be purchased. It will supply power to the future track loop off the wye. The wires will eventually be connected to a terminal block in the gray junction box on the back wall. 10. Here's a view from the back wall showing where the new supply line and waterfall/filter unit inlet line will be connected up. I'll be finishing the plumbing tomorrow and the line will be buried. 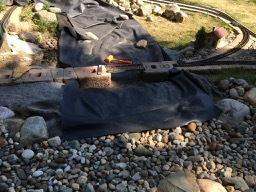 That will complete the most difficult aspect of installing the new waterfall - connecting up to my existing water feature. I'll be able to take some time finishing up the details. The existing water feature will be usable while I complete construction. I may even take a chance that Ol' Man Winter is finally gone and put the pump back in this week! 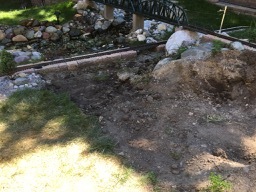 I finished up and buried the connection for the new waterfall last week. Pics 1,2 &3. We had good enough weather for me to put the pump back in. I also finished chipping my LGB 2143 "Thusis" last weekend. 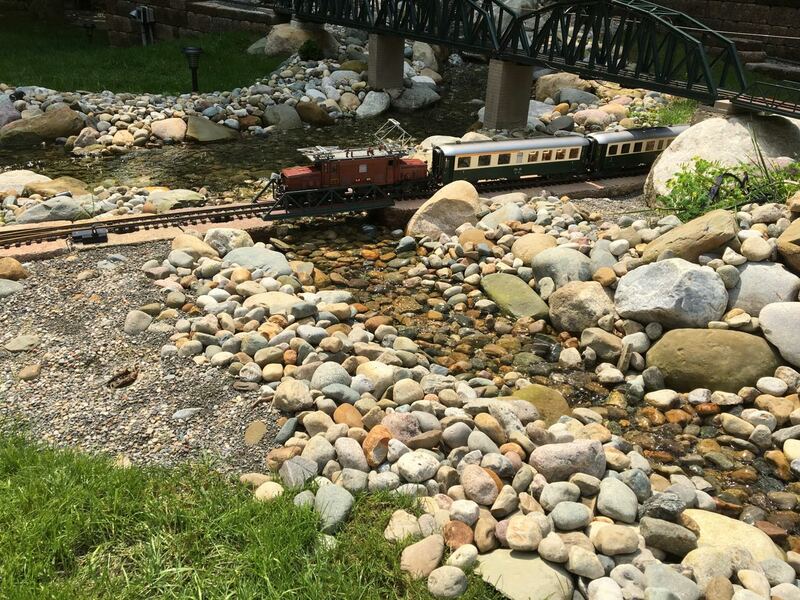 Here's a shot of it crossing the "river". 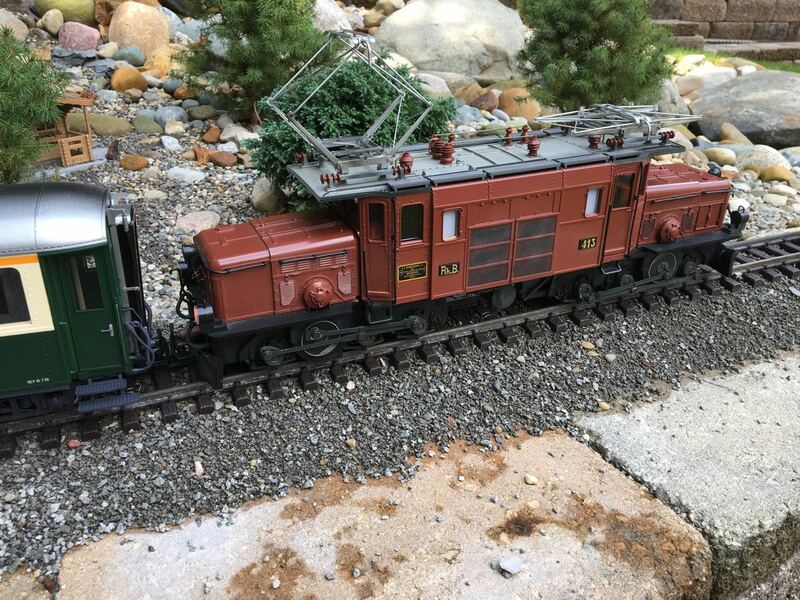 I think it looks pretty sharp hauling the newly released green and cream liveried RhB passenger coaches (a Christmas/Birthday present to myself)! Looks like some frost burn got two dwarfs planted by the Crossing Keepers hut last Fall. Hope they make it. The rest that were planted made it through the Winter OK. They can be seen by the train in the upper left of the pic. Really coming together. Looks great. Excellent railway! Great to see the long straights and sweeping curves, with RhB stock. Fully agree with you about 'virtual catenary' - all my locos run with pantographs up at all times, but then again I haven't put any overbridges or tunnels in yet! Another shot from today when taking the "pseudo curve transition" pics. Thusis northbound on the bridge. Here's my latest - I finished putting in a passing siding Wednesday. 1. This photo taken last Fall shows the "before". The siding will parallel the long straight in the upper right of the shot. The next five shots show the construction. 2. I'm beginning to dig a trench the block will be set in. The existing right-of-way can still be seen. Some of the track has been pulled up. Not seen in the lower left is the near point (LGB R3) I put in last week. In 3 the trench is done and I've put in a string line above the rail. This will guide installation of the block and give a reference for elevation. Picture 4 shows the block being installed for the far point (LGB R5). In pic 5 most of the block is installed. The orange 4 lb. dead blow hammer was used to set the block. The block was put in much like pavers are laid. A compacted base of slag sand was put down first. On this about one inch of loose slag sand laid. Then the block was put down and pounded into place to make it even with the prior block and level with its neighbors. 6. All the block is down and I'm beginning to lay the track. 7. 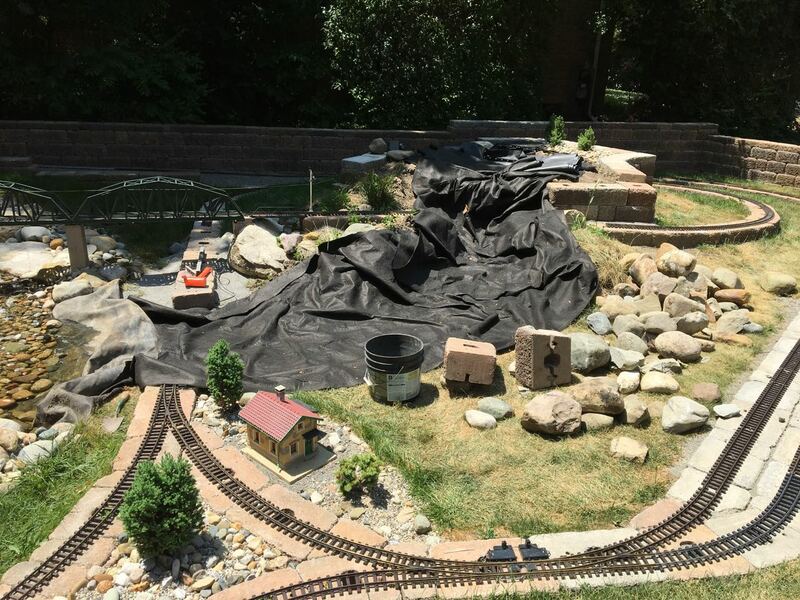 The trackwork is done! The space between the tracks is perfect for the Faller/Pola 330908 and 330909 platforms. I may be putting" Schönweiler" here but haven't made a final decision. Here is my updated CS3 track diagram. 8. Tuesday evening - testing it out! 9. Wednesday was dry and I caught up on the yard work. 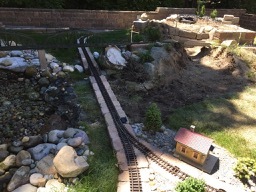 Got the grass cut then ran some trains. Here a couple of trains are awaiting departure. I'm sure this has been asked / answered already, but where did you get the blocks you are using from? Home Depot? There is a local S.E. Michigan company, Fendt, that manufactures concrete pavers and wall stones. The blocks I'm using are called "Old World Country Manor". The standard wall blocks are 6 inches high. They have hollows like regular concrete building blocks but are much more robust overall. 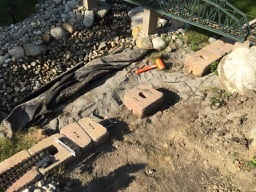 The blocks also have round holes for fiberglass alignment pins used when building walls. Fendt also makes 3 inch high cap "stones". These are solid concrete. The cap stones are what I primarily used for the passing siding. 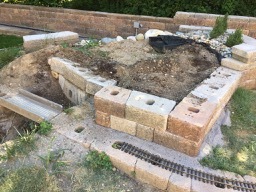 I was able to buy "seconds" that I used for of the right-of-way where the block is mostly buried. Fendt has discontinued this particular line and I was able to purchase my most recent lot, about 7,000 lbs, from their yard at a greatly reduced price. Delivery at $250 would have cost almost as much as the block. Luckily they are close by and are used to working with individuals in addition to contractors. They set the block aside and let me come and go till it was gone. It took me all day and nine trips in my Jetta Sportwagon to bring the block home. I would have needed to re-stack the block for temporary storage anyway so this was just a "bit" more effort. Who needs a gym membership! Here's what my remaining stash looks like. I've got enough for about another 100 linear feet of right-of -way. Some of the pieces on top are remnants from diamond sawing block sections to fit. While I was at it I took a few more RR shots. Here's what my remaining stash look like. I've got enough for about another 100 linear feet of right-of -way. Those are great photos! Thanks for the info! I may lay another leg of my railway on brick instead of with ballast, Ill have to see which is more costly. What made you choose to run on bricks? 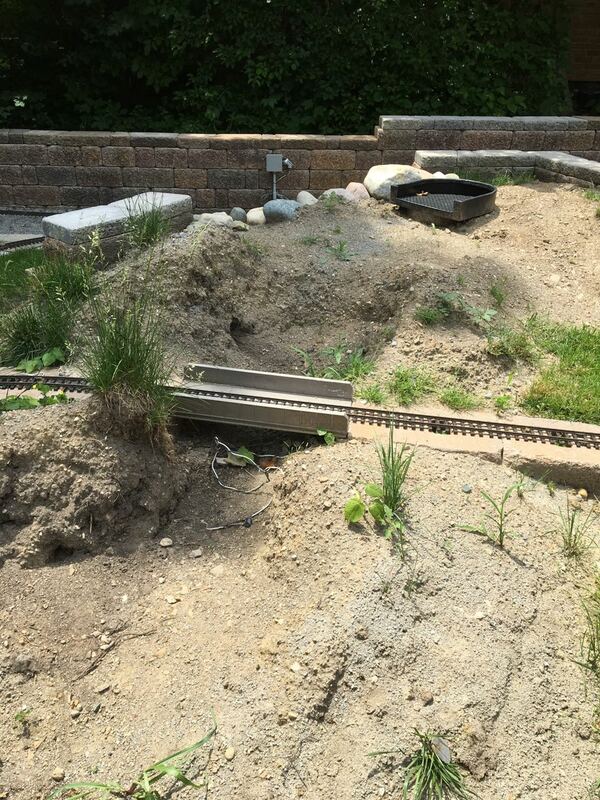 I put my initial temporary line down on compacted slag sand and also used slag sand for ballast. 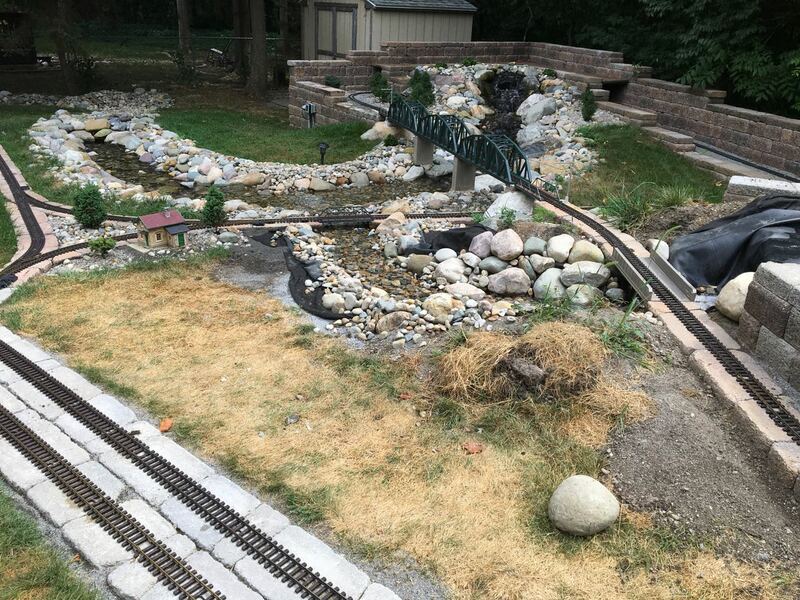 It looked great and held the tracks in place nicely. But, it didn't take long for the grass to begin encroaching on the right-of-way. Every couple of weeks in the growing season I needed to attack it with a string trimmer and add a bit more ballast. I didn't like the idea of putting down metal or plastic edging to keep the grass at bay. I just don't care for the looks of it. I do intend to add ballast to the tracks but need to find some way to retain it on the block. I plan to experiment using diluted exterior grade wood glue (PVA) much like is used to fix ballast in the smaller scales. As the track is floating and not fixed to the block, I thought I'd just glue down the edges and have loose ballast in between where the ties sit (thats sleepers to you Old World types). Wood glue by the gallon is pretty cheap at the local HD or Lowes. I just haven't got a round TUIT. Anybody out there got a spare? Actually, your inquiry might just prompt me to try it out on a test section soon! Filcris down, track down, but how to fix the ballast? Jon D. was right in Post#8. 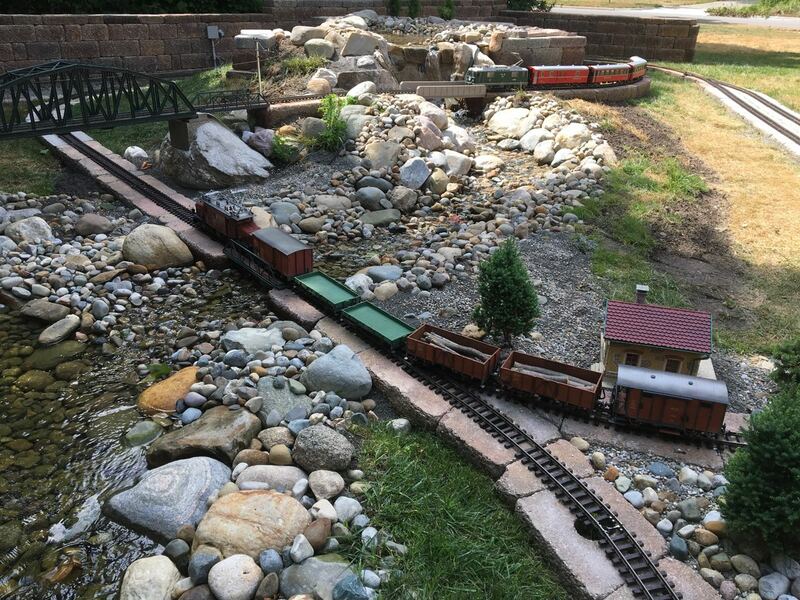 After having to take up the boards covering my "tunnel" to access derailments five or six times I decided to add galleries to the outside walls for easier access. Yesterday I finished one side. The first pic shows the wall after unstacking block. Batter boards would not support the weight of the blocks so I decided to use 5" x 1.75" x 3/16" steel U-channel as headers for the galleries. There is a metals distributor in town where I was able to get steel channel off-cuts at a good discount. Two 5 foot lengths cost me $65. I cut each in half giving me four 2.5 foot lengths. The next two shots show the channel in place. I nibbled away 3/16" of the supporting blocks with a diamond saw so that the trough of the U-channel was level with the top of the block. This also keeps the channel centered on the blocks. 3. A pair of slots were cut in the blocks that sit on the channel with a diamond saw. The mid-section of the block bottoms out in the trough of the U-channel. One of the blocks can be seen in the photo. I also re-leveled the track while it was totally exposed. 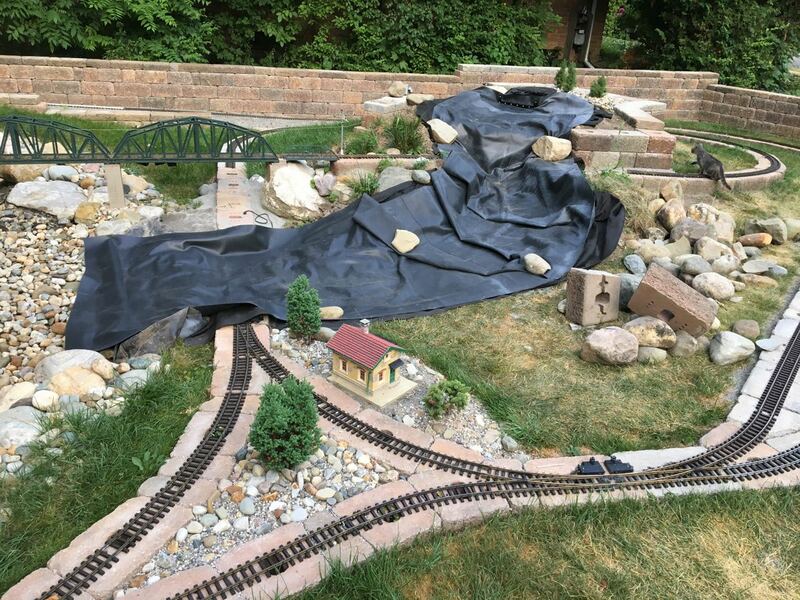 The derailments were happening where it had settled. 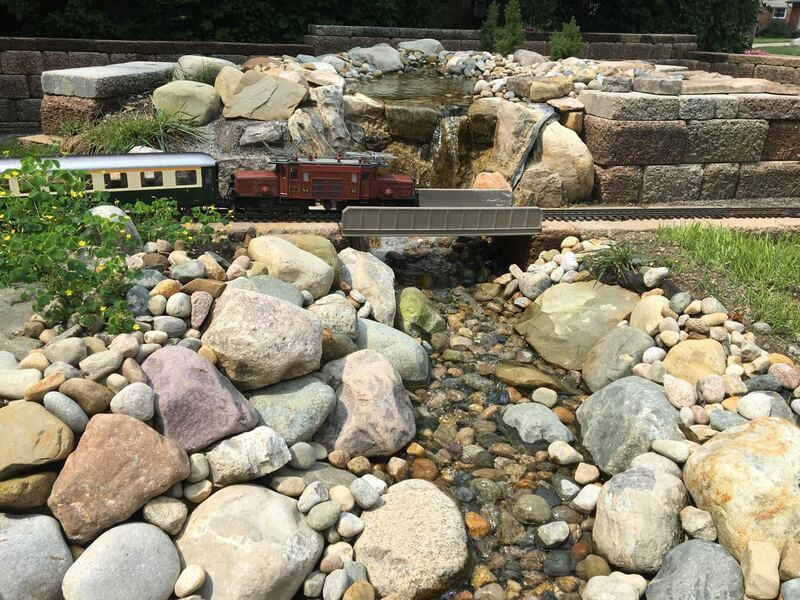 The train in the picture was testing the adjusted track. 4. Here's the finished wall with the two galleries. I need to fill the holes in the exposed blocks. Maybe I'll use expanding foam but haven't decided yet. The drain for backwashing the waterfall filter can also be seen here. The next few shots are of my Schöllenenbahn HGe2/2. I just finished chipping it last week. The first is peeking through one of the new galleries. It took about six hours to finish the galleries in side wall of the tunnel once I had started. It was actually much less time than I was expecting. Now I need to get the back wall taken care of! 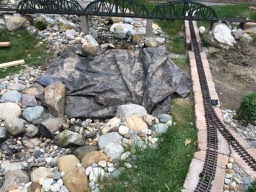 As promised - more photos of the second waterfall I started earlier this year. First, a reminder of where I left off. Here's the watercourse outfall/filter put in this Spring. The next two images show a bit of the landscape work around the outfall. 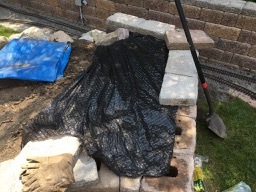 Weed block is put down and some rock fill added. 4. The new watercourse before "excavation". The next seven pics illustrate various stages of progress. 5&6 are the foundation for the waterfall. 7&8 digging the watercourse. In 9, the original watercourse liner is exposed. This was actually a low area that held too much water. I added about 10 cu.ft. of sand underneath the liner here to raise the base a bit. The block right-of-way for the track is being modified in 10. The lower bridge that was originally where the orange mallet is located was moved about 3 feet nearer the turnout in the lower left. 11. shows the new liner attached to the outfall. 12. The liner underlayment is in place. 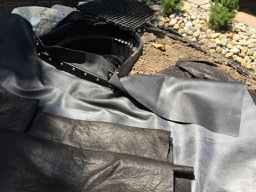 This is a very thick landscape felt that protects the bottom of the liner from punctures from below. 13. Here the 40 mil EPDM liner is in place. Three more dwarf Alberta spruce trees were planted behind the outfall. The next two shots are of the lower bridge being put back in. The liner wraps up between the blocks that act as bridge abutments and their adjacent right-of-way blocks to keep the water contained. 16. 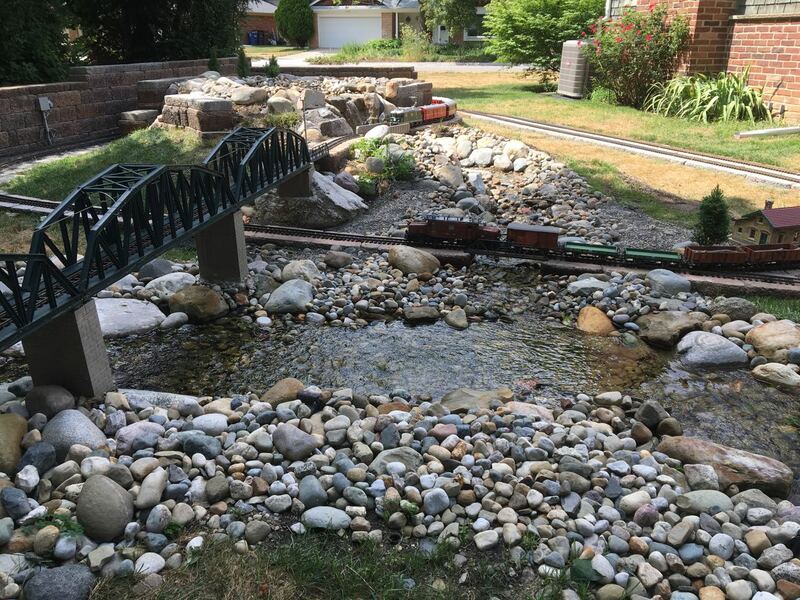 Here most of the rock is in place and the watercourse is being checked for flow and "leaks". 17. Another view looking form the opposite side. 18. Below. The rock face of the waterfall is nearly complete. This was "leftover" natural and cultured rock veneer that I got cheap. It was cemented in place with quickset mortar. And, boy was it quick! The temperature was in the low 90s F when I did this part of the job. I only mixed half a sack at a time using cold water but it still began to set and was no longer workable after about 10 minutes. It's a good thing I read the directions, mixed small batches and had what I needed immediately at hand. I did need more veneer and mortar to finish the job a few days later. At the same time I also picked up some compatible set retarder for the mortar. It made the rest of the job much less hectic. 19. 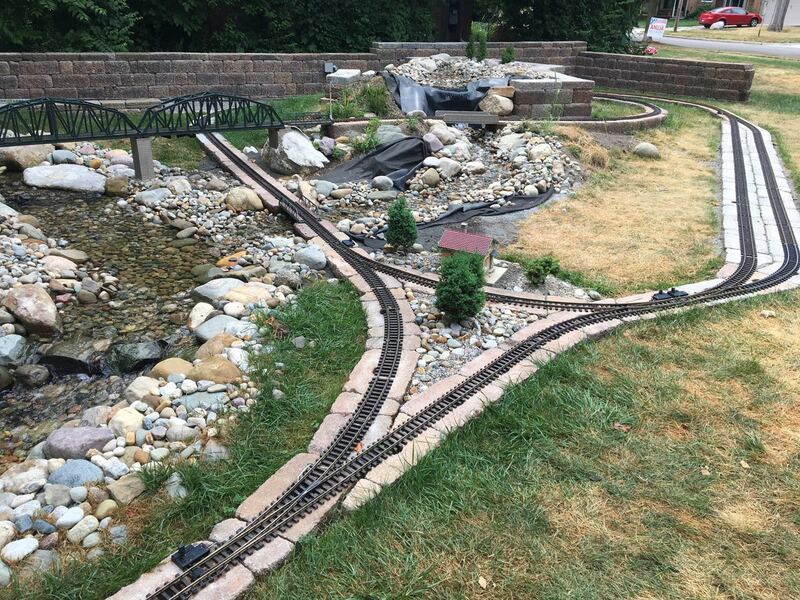 These last two shots are of the nearly finished watercourse. 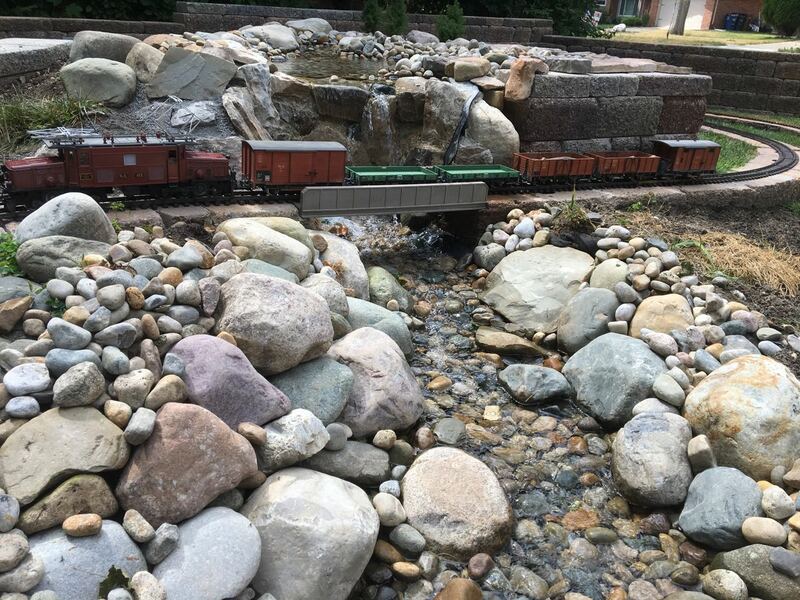 There is no discernible loss of flow in upper stretch of the original watercourse even with the new stream's isolation valve wide open and a good flow over the new waterfall. Phil, did you do the weathering on the side rods of the Croc, or is it just a shadow, think i like it better than whats on mine? That's some first class civil engineering. I also like your track plan. Fantastic looking... way over engineered ( shows that you do this for a living )..
Two chairs : what does the other have to say about this empire ? Great job , narrating and pic taking .. ! Answers to your ?s and a few more Crok pics taken today. This was the one of the first two LGB loks I bought. I purchased it at a toy and stationary store in Heidelberg called Knoblauch on a trip to Europe back in 1984. It cost what was a small fortune to me at the time - about $600 and it was my pride and joy! The other was a Stainz Blue Train starter set. I knew Knoblauch's from when I was a small child. My father was in the U.S. Army and we lived in Heidelberg from 1959-1963. Toys were on the second floor and there was a long curved slide kids could take back down to the ground floor. I was just 6 when we left. 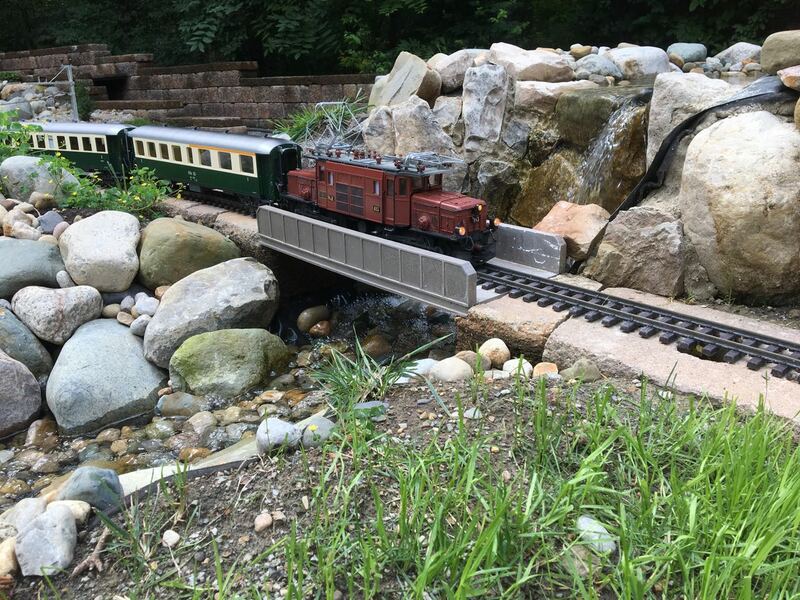 Knoblauch's is where I got my first Märklin HO train set. (I really think my dad bought it for himself!) Unfortunately, the store is no longer there. It had disappeared by the last time I visited around 2006. But, back to the croc. 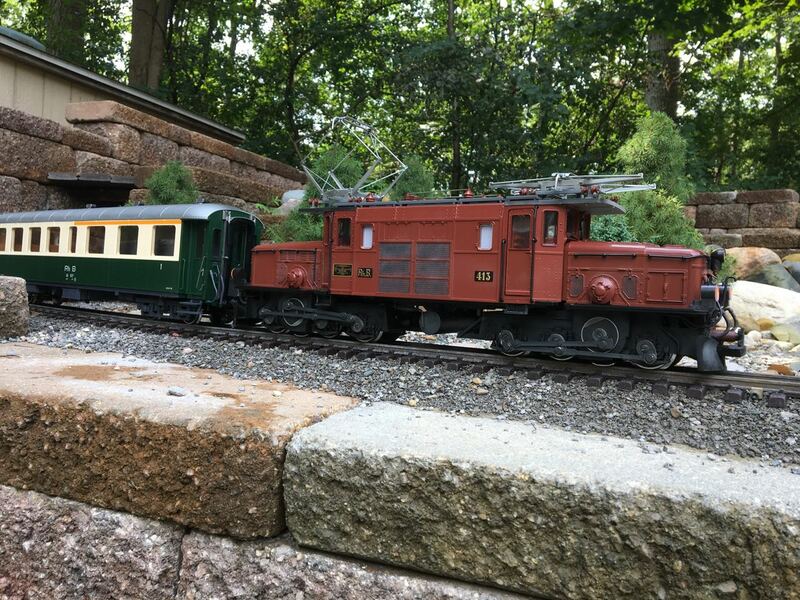 I had practiced weathering on some gons, flats, and boxcars. Yet, I still really had to screw up my courage to attack the croc with brush and airbrush! I think the result is an improvement over the stock loco even if I have ruined its collector value. The original red roof and pantograph insulators were painted a glossy dark chocolate brown similar to the finish of other ceramic insulators I'd seen. The exposed roof wiring was given a light wash of green to give the patina of aged copper. "Grimy black" was used on the side-rods, counterweights, and to in-fill all the grates. I also carefully painted the undersides of all the louvers with grimy black to give the appearance that they are real. I painted the buffer housings brown to match the body. The final touch was to very lightly spray the entire under-carraige with "grimy black" and then follow it up with another very light spray of "dust". Both grimy black and dust were highly diluted. This was all done about 30 years ago! 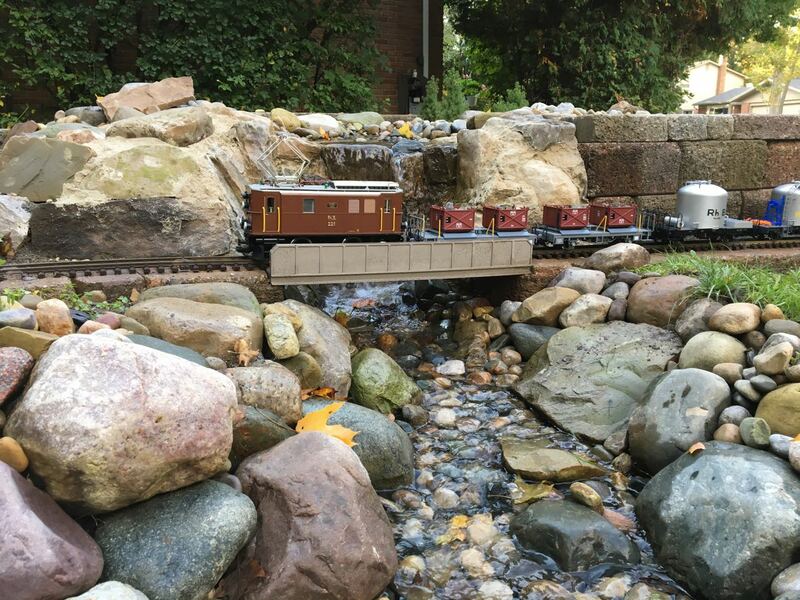 Here a three more pics showing the new waterfall and stream. My sister lives in the house along with me. She is also a big train fan. As to the shed and/or garage - yes, it sure would be nice to just drive the trains inside for the night. A project for the future among many others! I do like that, hadn’t even noticed the other bits of weathering. Might attempt that if I feel brave. Admire the planning and patience in putting this together.